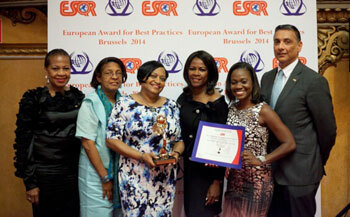 SIMPSON BAY, St. Maarten (Monday, June 9, 2014) - The Princess Juliana International Airport, SXM, stood out once again on the international arena when it received the European Award for Best Practices in Brussels, Belgium, last week. President of Parliament, drs. Gracita Arrindell, and deputy Minister Plenipotentiary Josianne Fleming-Artsen joined the SXM delegation led by Managing Director Regina LaBega at the awards ceremony at which around 70 companies, organizations, and public administrations from around the world were honored. SXM Airport and by extension the destination, was the clear favorite among the awardees. Many congratulated LaBega on an excellent speech, and noted that because of how well she sold the destination, they plan to visit St. Maarten. “Attending the award ceremony was a great way to not only showcase our airport and island, but to network with business executives from around the world,” said LaBega. SXM Airport along with a company from Cuba, were the only two companies from the Caribbean that received the award. Award recipients, consisting of hospitals, universities, industrial companies, IT companies, health organizations, etc., hailed from Ghana, Togo, Mexico, Georgia, Ethiopia, Sri Lanka, Dubai, Malaysia, Japan, and other nations. The SXM delegation also included Corporate Communications Specialist Kalifa Hickinson, and SXM Customer Service Representative Ann Marie Gane. Also attending the ceremony was Perry Geerlings, Director of the Cabinet of the Minister Plenipotentiary in The Hague. “It was truly a spectacular experience to witness SXM Airport being recognized for the quality of its services and its operations in such a manner,” noted Ms. Hickinson. She added that members of the delegation accompanying SXM from The Hague repeatedly expressed how proud they are of SXM Airport. President of Parliament, drs. Gracita Arrindell was also beaming with pride and considered it an honor to be a part of such a prestigious event. The European Awards for Best Practices program is one of the pillars of the European Society for Quality Research (ESQR) recognition programs, which seek to expand the quality culture and motivate the commitment to the quality implementation models and programs. The award winning companies and organizations are selected by ESQR based on the results of the ESQR’s polls, consumer opinion research and market study. Past winners of the award in the aviation sector include Air Baltic from Latvia, All Nippon Airways from Japan, Ethiopian Airways, and Aeropuertos Argentina 2000. SXM plans to hold a special event for all of its staff as a “thank you” for their commitment and hard work, in making the airport truly stand out as a top international airport in the region.